IHRC was honored to host the event yesterday that it streamed live on IHRC.TV which provided maximum exposure for this crucial campaign. 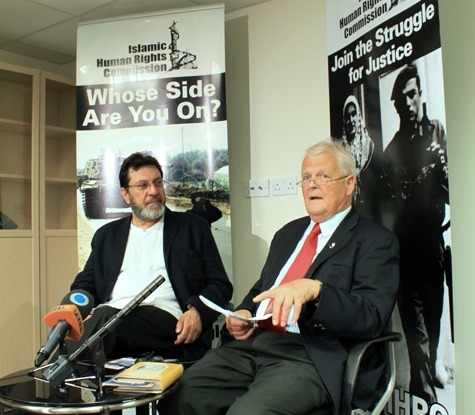 The Chairman of IHRC Massoud Shadjareh opened up the event with an introduction on the power of justice and equal rights, this was followed by a short speech from Bruce Kent the Vice President of Pax Christi, the Catholic peace and human rights movement. An active spokesman for the Campaign for Nuclear Disarmament (CND), Kent has also worked on behalf of prisoners and detainees for many years and is now helping to advocate the cause of Talha Ahsan. Kent read out one of Ahsan’s most famous poems which provided the title of his book This be the Answer’. The idea of the poem came from when a prisoner cleaning toilets was being mocked by a guard “Where is your God now?” Bruce Kent also read the poem ‘Life Sentence’ which is aptly titled to describe Ashans’s current situation. Gareth Pierce a human rights lawyer also provided a keen discussion on Talha Ahsan’s situation and drew parallels between Ahsan and other people like Julian Assange’s request for extradition to USA. She explained the absurdity surrounding Ashan’s arrest and extradition request to America, especially since he has never been to the States before. This was followed by Ahsan’s brother Hamja providing the audience with action points on how we can help Talha by lobbying our MPs and also sending messages to Talha in prison to keep his spirits up and help him continue the fight for justice.